Since moving to West Limerick, one architect seems to have dominated many of my blog postings on the architecture of this part of Ireland. James Pain (1779-1877) was instrumental in introducing the Gothic Revival to Limerick and the surrounding counties, and was, perhaps, the single most influential architect in in this area in the 19th century. His churches throughout Limerick and Clare include Holy Trinity Church, Rathkeale (1825), Saint Michael’s, Pery Square, Saint Saviour’s Dominican Church in Limerick, All Saints’ Church, Stradbally (Castleconnell), Castletown Church, Mungret Church, Drumncliffe Church, Ennis, and Kilnasoolagh Church in Newmarket-on-Fergus. He also worked on Saint Mary’s Cathedral, Limerick, and Saint Munchin’s Church. Pain also designed the Old Rectory in Askeaton, and the houses he worked on include the Tontine Terrace in Pery Square, Limerick, Elm Park, Clarina, with its surviving gate lodge, Glin Castle, Castlegarde, Dromoland Castle, Curragh Chase near Askeaton, Adare Manor and the Dunraven Mausoleum in Adare. His public buildings in Limerick include Athlunkard Bridge, Baal’s Bridge and Thomond Bridge, the Corn Market, the former Exchange in Nicholas Street, the former City Gaol in Saint Augustine Place, the County Gaol in Mulgrave Street, Rathkeale Courthouse, the Custom House on Custom House Quay, Villiers Almshouse and Villers School on Henry Street. I have written about many of these buildings in recent months, but was reminded when recently passed the site of the house on Glentworth Street in Limerick where James Pain had lived in his closing years that I had written little about the architect himself. James Pain was born in Isleworth, Middlesex, in 1779, and was living at 17 Upper Glentworth Street at the time of his death in 1877. He was the eldest son of James Pain, a builder and surveyor, and his grandfather, William Pain, wrote a series of builder’s pattern books. James and his younger brother, George Richard Pain (1793-1838), were both pupils of the great Regency architect John Nash (1752-1835), who was responsible for much of the layout of Regency London under the patronage of the Prince Regent, and during his reign as George IV. When Nash designed Lough Cutra Castle, near Gort, Co Galway, for Charles Vereker in 1811, he recommended that the two brothers should be placed in charge of the work, and so they came to Ireland. 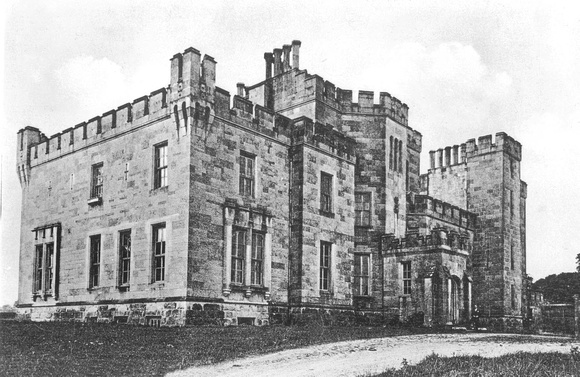 In 1813, James Pain produced a proposal to rebuild Dromoland Castle, Co Clare, for the Earl of Inchiquin. James was granted the freedom of Limerick on 1 July 1816, followed by his brother George Richard on 29 January 1817. Meanwhile, their work at Lough Cutra Castle continued. However, James was badly injured in 1817, suffering concussion and a broken collarbone, when he fell from a height of four storeys at the castle after scaffolding he was standing on gave way. When he recovered, James continued in business as an architect and builder in Limerick, while George Richard established himself in Cork. They worked in close partnership until George Richard Pain died in 1838. Together, these brothers were responsible for a large number of buildings throughout the south and west of Ireland, including churches both Church of Ireland and Roman Catholic, country houses, court houses, gaols and bridges. The Pain brothers also designed Mitchelstown Castle for the Earl of Kingston, and the courthouse in Cork, with its splendid Corinthian portico. Through in influence of John Nash, James Pain was appointed architect to the Board of First Fruits for the Church of Ireland province of Cashel in 1823. In this post, he was responsible for all the Church of Ireland churches and glebe houses in the province, and George Richard Pain acted as his assistant. James continued to work for the Board and, following the Church Temporalities Act (1833), for the Ecclesiastical Commission which replaced it, until at least 1843. Six volumes of his survey plans of churchyards, including plans and elevations of the churches, from the 1820s to the 1840s, are in the Representative Church Body Library in Dublin. While George Richard Pain died relatively young, James Pain lived on in Limerick to the great age of 98. He was living at Upper George’s Street (now O’Connell Street) in 1824, and is later recorded as living at 33 George’s Street (1846-1856) and then at 35 George’s Street (1863-1875). After the early 1840s, Pain appears to have received very few substantial commissions. In their study of the architect, David Lee and Debbie Jacobs suggest several reasons for this, including the bad publicity associated with building Thomond Bridge, the death in 1842 of his patron and supporter, Lord Gort, the reform of Limerick Corporation that same year, and the centralisation of the architectural department of the Ecclesiastical Commissioners in 1843. Moreover, during the years of the potato famine, the incomes of many potential clients from the landowning class were much reduced. 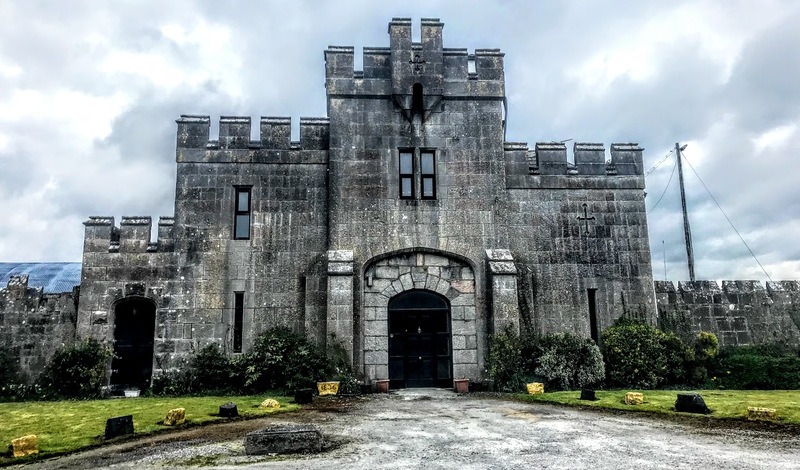 His last large commission appears to have been the addition of a west wing and other alterations to Knappogue Castle, Co Clare, begun in 1856, while he continued as architect to the Board of Superintendence of Limerick County Gaol until 1863. James Pain was living at 17 Upper Glentworth Street when he died on 13 December 1877, aged 97. He was buried in the Vereker family vault in the churchyard of Limerick Cathedral on 17 December 1877. He was a widower at the time of his death – his wife Harriet died many years earlier in London in 1834, and they appear to have had no surviving children. In his will, James Pain makes bequests to numerous nephews and nieces in Ireland and England and their children. To his niece Sally, daughter of George Richard Pain and wife of Henry Vereker of Limerick, he left ‘a small marble bust’ of her father, a portrait of himself by Joseph Patrick Haverty, and a bust of himself by Vereker. His executors were to distribute his library and portfolios of drawings and engravings among his relatives or to destroy them. The drawings included a design submitted by the Pain brothers in the competition of 1836 for the new Houses of Parliament at Westminster. David Lee’s MA thesis at the University of Limerick was a study of James and George Lee (2003). The study of James Pain by David Lee and Debbie Jacobs, James Pain, architect (Limerick Civic Trust, 2005), is particularly useful for its use of local sources and for general background information. 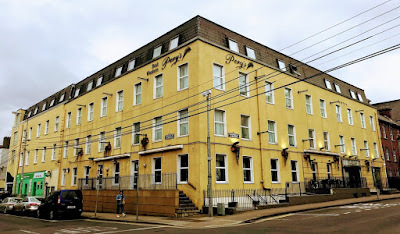 Today, the house where James Pain spent his closing years is part of Pery's Hotel, an independently owned three star hotel in the Georgian Quarter of Limerick, in the very heart of the city. As I was exploring the village of Clarina last weekend, I came across Clarina Lodge, an unusual architectural survival from the Victorian era. This is a surviving gatehouse from the Elm Park estate of Massey, and while Elm Park has been demolished and the former gate lodge has been converted into a private house, it offers an insight into an era that has long passed. The title of Baron Clarina was created at the Act of Union in 1800 for Eyre Massey (1719-1804), the sixth son of Hugh Massy of Duntrileague, Co Limerick, and his wife Elizabeth, daughter of George Evans and sister of George Evans, 1st Lord Carbery. Eyre Massey and his branch of the family inserted an ‘E’ into their family name to distinguish themselves from the Duntrileague branch of the family. As prominent general in the 18th century, he was known for commanding the expedition to Niagra in North America and for his successful action at La Belle-Famille during the French and Indian War. He was MP for Swords, Co Dublin, before being made a peer in 1800 with the title of Baron Clarina of Elm Park, Co Limerick. The title and the estate passed in turn to his son, Nathaniel William Massey (1773-1810), 2nd Baron Clarina, and his grandson, Eyre Massey (1798-1872), 3rd Baron Clarina, who held the title for 62 years in the 19th century. This 3rd Lord Clarina married Susan Elizabeth Barton in 1828. She was an 18-year-old heiress, and her father was the Irish-French wine baron, Hugh Barton. Lord Clarina celebrated his marriage by builing a new house at Elm Park in 1833-1836, at a cost of £50,000 and with an abundance of towers and castellations. 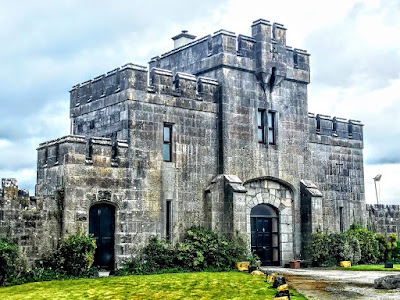 The house and the former gate lodge were designed by the Limerick-based architect James Pain (1779-1877) and his brother George Richard Pain (1793-1838). At the time of Griffith’s Valuation, the main part of Lord Clarina’s estate was in the Parish of Kilkeedy and the Barony of Pubblebrien, Co Limerick. This estate included Elm Park, and the buildings were valued at £90. In the 1870s, the estate of Lord Clarina came to 2,012 acres. Following the death of Lionel Massey (1837-1922), 5th Lord Clarina, the estate was sold in 1923. Td the title became extinct in 1952 with the death of his son, Eyre Nathaniel Massey (1880–1952), 6th Baron Clarina. Meanwhile, Clarina Castle or Elm Park and the estate were bought by Patrick King in 1925. They were offered for sale again in 1946, when the house was described by AJ Sexton, Auctioneers, in the Limerick Leader in July 1946, as a ‘gentleman’s residence, on 54 acres of land.’ The accommodation included a reception hall, drawing room, dining room, six bedrooms and bathrooms. The house was due for auction at 12 noon on Saturday 13 July 1946. However, Clarina Castle or Elm Park remained the home of the King family until 1956. Later, the house was completely demolished in the 1960s. Clarina Lodge was once one of the two gate lodges built around 1828 by the architect brothers James and George Richard Pain for the Massey family. The carriageway in the former gate lodge has been enclosed to increase accommodation in the house. It is one of the few surviving buildings from the estate and give a tantalising hint of the appearance of the lost house. This handsome and impressive former gate lodge includes a single-bay, two-storey slightly projecting centre-bay, with lower and recessed single-bay, two-storey wings to the north and south, and a single-bay, single-storey entrance block in the south wing, on the south side. There are cut limestone crenellations along the roofline, with rendered chimney-stacks, and a projecting parapet to centre-bay. The building has ashlar limestone walls, with a limestone plinth course and buttresses to the centre-bay. There are blind cross loops to the north wing, the first floor and the projecting parapet. The window openings include square-headed openings and bipartite square-headed openings. A notable feature is the elliptical-headed former carriage arch with cut limestone voussoirs and an inset segmental-headed opening with a glazed overlight over the timber panelled door with flanking sidelights. The shallow pointed arch opening on the south block has a rusticated limestone block-and-start surround and double-leaf timber battened doors. The sweeping crenellated limestone walls to the north and south terminate in a pair of crenellated round-profile limestone piers. Although it is no longer in use as an entrance, the gate lodge is a reminder of a time in Irish history that is long gone and an insight into the former status of the Elm Park estate. The use of Gothic Revival details and dressings, seen as the crenellated bays and the cross-loop details, is a tribute to the craftsmen of the past.